SUN-N-SAND, Biloxi, Mississippi. This beautiful mosaic, depicting Biloxi’s famous Blessing of the Fleet is made from vari-colored marble chips imported from Italy. The mural makes a fascinating backdrop for the Restaurant which, with 175 beautiful rooms, makes Sun-N-Sand one of the finest resorts in the country. 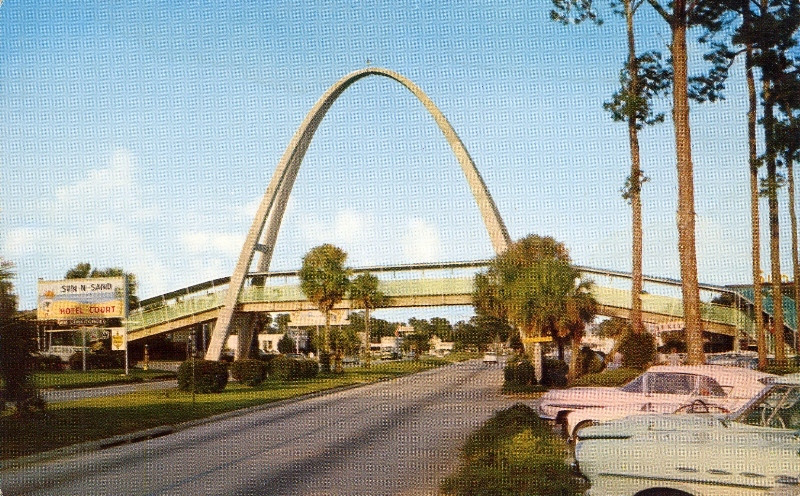 The Sun-n-Sand had a beach side and a land side, as seen in this 1960s postcard. Maybe Tom Barnes can tell us more about this long-gone motel and what happened to the marble mosaic imported from Italy. Sun ‘n Sand Hotel Court . . .showing the picturesque overpass spanning U.S. Highway 90. Located between Gulfport and Biloxi, Mississippi. The Sun ‘n Sand Hotel Court postcard tells of the lush immediate post World War II prosperity of the coast. What of postcards or photographs of other motels, like Moody’s Tourist Court, and don’t forget the night clubs and that restaurant with the circular dinning room with the old oak trees between the tables–the name of which escapes me. Anyone remember??? Eric, thank you! Yes, it was Angelo’s!!! I may have thought it was a round dinning room for back in the late 1940’s the small child that I was swiveled my head round and round wondering at the trees and the views out of the large plate glass windows. People went to such places back then wanting to look their best and enjoy the fine food. Remember the shrimp cocktails with the shaved ice, red sauce, and fresh peeled shrimp? Where is Mr. Peabody and the Way-Back-Machine when one needs it!!! I guess that overpass has been long gone, hasn’t it? Sadly yes. I don’t think something so svelte would be allowed to be constructed these days. I did recently read a short article that included the name of the company that designed the overpass. It was an engineering firm I was not familiar with. If there is interest maybe it’ll be a future MissPres post? There was a restaurant called Angelo’s if I remember…seems like it was somewhere between Long Beach and Gulfport on HWY 90. I was only about 7 years old when we used to eat there in 1967 before Camille. I’m not sure there was a circular dining room, but the buildlng was mostly wrought iron and glass and had oak trees passing thru the dining room. The William Tally House was also another restaurant located in front of the Edgewater Mall, seems like it might have had a circular dining room with a large tree but I just can’t remember. Any of these sound familiar? Moody’s was a regular stay for our family as I grew in late ’40’s thru the ’60’s. Memory has it a little west of Gulfport. I have postcards for both of those establishments, and thought I had posted them here at some point, but now I find that I haven’t. I usually put those in the Vacation Postcards series, and our next vacation here on MissPres will be the week of July 4, so I’ll move those into that. Yeah Eric, I remember those places. We used to drive down from Laurel on Saturdays to go there, and Baricev’s, and Friendship House, although for some reason the neon shrimp creeped me out. Once again, a post both gladdening and mournful at the same time. My mom and dad spent their wedding night and honey moon there. I tried to post a picture but couldn’t. Hattiesburg had its Sycamore Inn with the tree inside behind the bar and rising up through the roof. 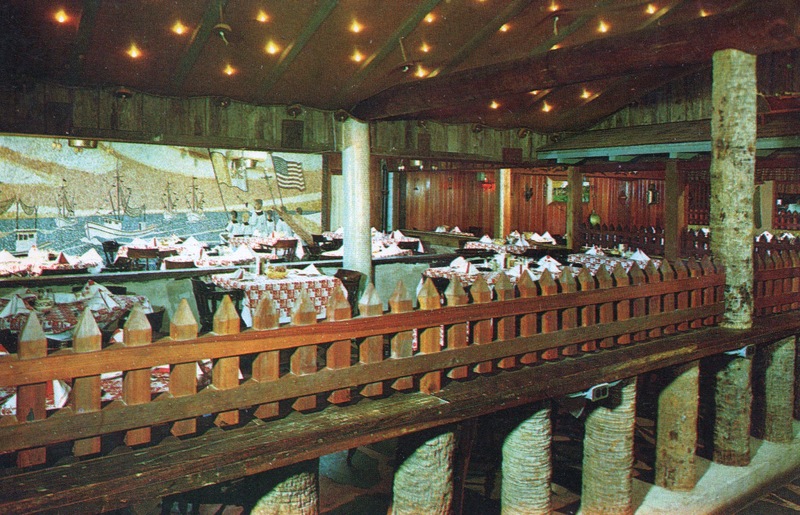 The Inn was right up there with the Oaks, Speed’s and The Wagon Wheel for fast food dining. There are no post cards. It had curb service as well as inside dining. I wish I knew what became of these remarkable interiors. The hotel itself disappeared before Katrina. I must research this! Stayed at the Sun-n-Sand several times when I was between 10 and 17 or 18 with my family. Great place, I remember a fancy pool on the beach side and a fishing pier where you could fish for mullet. Wish it was still there. This is Carole gillio. My husband Larry and I spent our honeymoon there January 25 1969. Tomorrow is our 50th and been reminiscing. We are feeling very nostalgic. We live in Slidell. I have a Long Beach high school album from the 1920s showing my mother and hale Boggs to donate to a ms museum? ?